« 3-2-1 Contact: Why Is Derek Jeter Swinging So Much? Responding to a post on Craig Calcaterra’s Hardball Talk, Rob Iracane of Walk off Walk noted that whenever the term lack of hustle is used, it almost always is in reference to a non-white player. Iracane’s provocative observation was supported by a Google search (“lack of hustle” and baseball”) that uncovered 22 instances, 21 of which applied to black or Latino players (David Wright was the only white player cited). I ran a similar search and a cursory glance also turned up the additional names of Paul O’Neill and Richie Sexson (as well as Shane Victorino), but the imbalance is still compelling. Pete Rose defined his era with a style of play that earned him the nickname Charlie Hustle. Ironically, the nickname was actually intended as a term of derision. Based on his search, Iracane concluded that the term “lack of hustle” is basically a form of veiled racism. At first glance, it is hard to argue with him. A charge of racism, however, should be worthy of deeper inspection, so let’s do that now. First off, in the incident that sparked the two posts, Brandon Phillips, an African American, was chided for not hustling by his manager, Dusty Baker, also an African American. Other cases, such as run-ins between Jose Reyes and Willie Randolph as well as Fernando Martinez and Jerry Manuel share a similar dynamic. So, off the bat, the issue appears to be more complex than just black and white. Besides, being black men, what else do Baker, Manuel and Randolph share in common? They all played in the same era…a time when “hustle” was a badge of honor. In fact, that’s the era that gave us Charlie Hustle (aka Pete Rose), the John McGraw throwback who very much helped defined the style of play during his era. Similarly, many of the beat writers covering the game also came of age in the late-60s to early-80s. Therefore, it should be no surprise that they demand the modern ballplayer share the same virtues as the icons from their childhoods. Another important to thing to consider in addressing the issue is whether the accusations of a “lack of hustle” were warranted. In just about all of the cases cited by Iracane, there seemed to be a compelling case, and in some, the offending player actually apologized. So, on the surface, it doesn’t appear as if non-white players are being falsely accused of a transgression. That’s an important factor to note. Of course, that doesn’t answer the question about why fewer white players are cited for a lack of hustle, or does it? Without the evidence to support the claim, I would guess that more white players were introduced to baseball by the traditional channels of little league and other forums of youth baseball development. This is probably particularly true relative to players from Latin American. Again, without doing a formal study, it seems a safe bet to assume that those organizing the little leagues and youth camps around the country were also influenced by the same aforementioned era of “hustle”. If hustling is taught as a fundamental part of the game in American little leagues, then it stands to reason that players coming from such a system will exhibit the same behavior in the major leagues. In his conclusion, Iracane basically argues for an end to evaluating a player’s hustle. Instead of ignoring “hustle”, I think it makes much more sense to understand its context. Throughout the history of baseball, the notion of hustle has ebbed and flowed (a New York Times search of “baseball” and “lack of hustle” displayed seven stories from 1851 to 1980). In Ty Cobb’s prime, tooth and nail effort was heralded, but that soon gave way to Babe Ruth’s “lazy” power game. 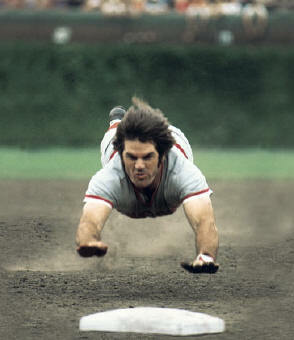 Even Pete Rose’s style of play wasn’t always appreciated. While the nickname Charlie Hustle now resounds as a great complement, the moniker was actually placed on Rose by Whitey Ford as term of derision. As the old story goes, Ford took exception to Rose’s “false effort” (running to first on a walk and trying to catch a HR that was well above the wall) and chided him with the moniker “Charlie Hustle”. We’ve seen transitions between styles throughout the history of the game, and sometimes the old guard needs to be dragged kicking and screaming. It probably is true that today’s players exhibit less hustle, but I would argue that hustle is simply not as important a part of the game. So, instead of being offended by the term, I look at is as more of a relic that will eventually fade away without crying wolf about racism.